In this world nothing can be said to be certain, except death and taxes. Who isn’t familiar with Benjamin Franklin’s oft-quoted statement, which still holds water 224 years later? And lest you be reminded, next Monday won’t vanish from the calendar. As sure as the sun rises in the east, on April 15 Uncle Sam will be knocking at your door, hand extended, demanding his slice from your hard-earned pie. Anticipating the sharp slope south in my bank account, I yearn for the comfort foods I enjoyed during the late 1970s, when my meager income insured a government-issued refund instead of a cut. And what better way to enjoy my windfall than at a tropical-styled Tiki bar. Dredge drained tofu into coconut-flour (see recipe) mixture, if frying. If you’re of a certain age you may recall the Americanized tropical kitsch of waterfalls trickling down into penny-lined pools, wood-carved Polynesian statues posing as sentries at the entry to the lounge, and the grass-skirt-clad waitress taking your order as you settled into your rattan woven chair. I recall sharing Pu-Pu platters with friends, followed by heaping platters of Coconut Shrimp with a sugary-plum dipping sauce. Coconut-inspired dishes, in fact, figured prominently on Tiki menus back then. Is it just me, or does dining out seem more serious these days? Were cholesterol and IRAs invented after the seventies? Here’s a recipe for a dish, inspired by tiki-bar menus of yesteryear, that will be kind to my pursestrings today. I substituted budget-friendly tofu for expensive jumbo shrimp. Protein-rich and cholesterol-free — the other white meat — it comes in a variety of textures: soft, silken, firm, and extra-firm. From my experience, soft and silken tofu is best for puddings, dips and desserts since it’s smoother and less grainy. 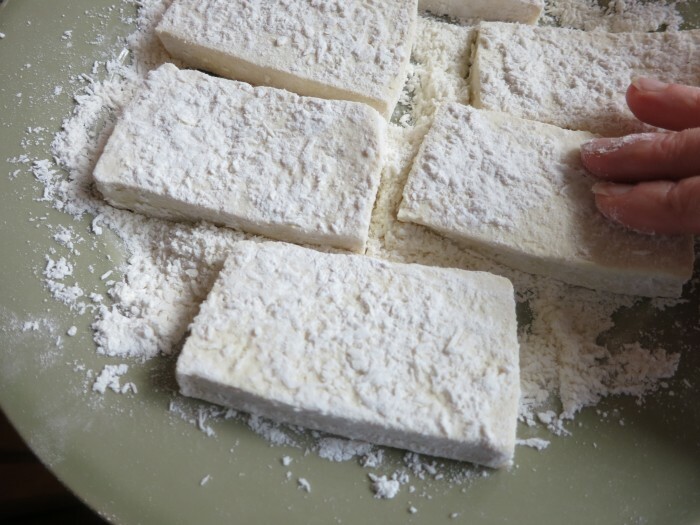 Soft tofu is usually too soft for stir-fries, and firm tofu may be too grainy for some desserts and dips. In this recipe firm or extra firm tofu works best. Next time I make this, I may increase the tofu’s flavor voltage by marinating it prior to frying it. 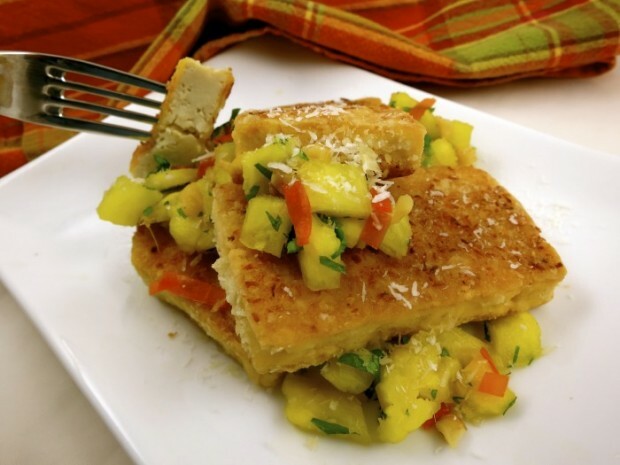 To save calories, you may bake the tofu instead of frying it. If doing so, I’d substitute panko for the flour and cornstarch and bake in a 375 degree oven until golden brown. Back in the day, I would have enjoyed a syrupy Mai Tai or Singapore Sling to wash down my Tiki menu treats. My palate, thankfully, has evolved and I prefer serving complementary wines with spicy, full-flavored Thai-inspired food. Pairing wine with Asian food can be problematic, and with this dish I avoid tannins, preferring a touch of floral sweetness, to balance the fiery peppers, acidic lime and pineapple. A Riesling, Gewurztraminer or sparkling wine would be a good choice. I always think local when selecting these types of wines; Michigan’s Old Mission Peninsula is known for producing top-notch Riesling grapes. An oversized tumbler of Fouch Vineyard Riesling from Two Lads Winery will be my choice of pain-killers for this year’s tax-payer blues, prompting me to end this blog quoting the wisdom of Mr. Franklin on a happier note: Wine is constant proof that God loves us and loves to see us happy. Cut tofu into 6 (2×3-inch) rectangular slices and drain excess water on paper towels. While tofu is draining, whisk together sugar, lime juice and 1 tablespoon of the peanut oil. Stir in hot pepper, lemongrass, basil, peanuts, pineapple and bell pepper, if using. Season with kosher salt and reserve. Lightly season one side of each piece of tofu with kosher salt. Combine coconut, flour and cornstarch on a plate. Press both sides of tofu into coconut mixture. 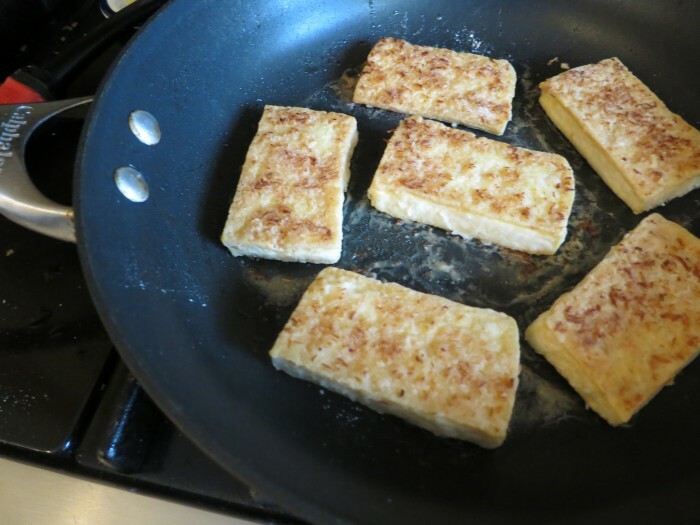 Heat 2 tablespoons oil over medium heat, and fry tofu about 15 minutes on each side or until golden brown, adding additional oil to pan if necessary. Adjust heat as necessary to insure the tofu maintains a steady, but not aggressive, sizzle. Drain a couple of minutes on paper towels. Plate tofu with salsa, sprinkle with coconut and serve.